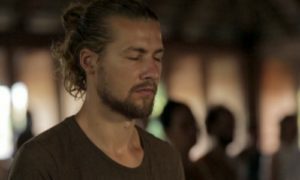 It was the first thing that I noticed when I arrived at the Hridaya Yoga Center in Mazunte five years ago. I have heard similar first impressions from others since then: “Where did all of these beautiful, healthy, shiny people come from?” It seemed that I had just arrived at some kind of sunny utopia from the depths of snowy France. As I settled into the school over the next few days, the community was so welcoming and warm, and I received so many hugs from strangers, that I felt like I had simply come home. Coming home. We use this metaphor a lot in Hridaya Meditation. Coming Home in the Heart. “Coming Home” is a feeling of comfort, a feeling that you can take off your town clothes and be completely naked, that you can move about at ease with yourself. It is no surprise that all of these people who were cultivating this feeling within were creating this reality around them. Sangha is a Sanskrit term that means association, assembly or company, but is usually used in reference to a “spiritual community.” It is one of the three jewels of Buddhism – Buddha (enlightenment), Dharma (the teachings) and Sangha (the community). Sangha is a brotherhood and sisterhood of walkers on the path to awakening who come together to support each other’s journey. Sangha becomes like a spiritual family of aunts and uncles, fathers, brothers, mothers and lovers who you can always rely on as you journey forth into the mystery and trials that all spiritual practitioners encounter. This family provides stability and a framework in which to grow; sharing experiences, difficulties, revelations and joy as all study together and express the teachings beyond hierarchy or laws. The law of Love seems to govern Sangha, and no one is excluded from its embrace. Sangha is there for you when your meditations are going great and going badly; when you write your first non-dual poem and when you are tired from hours of service. Sangha is there for you when you need a warm hug and when you need to be left alone. Sangha understands. However, this is no mere gathering of friends or buddies who share a common hobby. Sangha will reflect for you the most difficult parts of yourself, and occasionally tell you about them bluntly to your face. These family members are here for one purpose – to provide you a strong support and a mirror for the deconstruction of yourself. They are there to remind you to abandon your egoistic self-cherishing, and to stay on the path when you become distracted by external temptations. It is said in Buddhism that the survival of the teachings depends on the survival of the Sangha, and Buddhist monasteries and nunneries were created for exactly this purpose. It is often necessary to shelter ourselves from the demands of our busy lives in order to establish ourselves truly in the teachings. When we go to a monastery or join a dedicated spiritual community, we step into a framework that provides the ideal conditions for realizing Reality, surrounding ourselves with others who are doing exactly the same thing. Sangha has surrounded me with its loving arms so incredibly since my baby was born two months ago. Of course there were cards and presents and emails of love and congratulations from them, but even more, there were many who came to help me out in those crazy-amazing first months when you perform a parenting vigil every night and can’t manage to feed anyone in the house (especially yourself) but the baby during the day. When exhaustion set in, when the house needed to be cleaned, when the baby needed to be cuddled and put to sleep with lulling mantras, Sangha was there. I have never felt more grateful. While my eyes may be more tired than usual, and my shoulders are aching from breastfeeding and carrying this little Buddha, I have experienced a joyful peace in these last couple of months that has arisen from the feeling of deep, great support. I feel so lucky to have so many amazing aunts and uncles for little Benzra, so many happy silly faces entertaining him and so many hands to make my work and heart light. For the love of Sangha, I am eternally grateful.